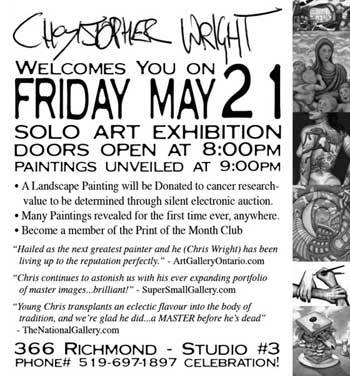 Christopher Wright will be showing some of his newest and greatest paintings to guests and collectors alike. 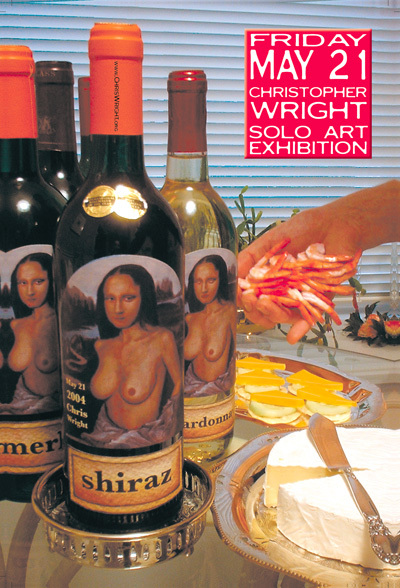 You are invited to come and join in the festivities associated with this great Solo Art Exhibition Celebration. • One spectatular landscape painting proceeds donated to the cancer society. Value to be determined through electronic auction. If you would like to recieve an invite by mail, please email lisa@supersmall.com and we shall send you one right away. Free! Snacks and beverages are also free! Enjoy yourself. what time should I arrive? How late does this event run? Opening runs officially until midnight but WILL run later then that. It's a fun studio. Feel free to stay as long as you want. Attend this crazy grand event, have fun and support your favorite artist. There is much work to be done. Volunteers welcome! Contact Crew@ChrisWright.org Writers and Promoters sought after.